I saw this $2 arrangement at a yard sale and it's not the flowers that caught my eye, but what was underneath it all.. Very pretty! I love the whole arrangement with the suitcases. Very cute. And good eye, seeing below the arrangement. Great idea to pull that apart and use only the urn. Very cute! The urn caught my eye too! I have the cord problem on my mantel! Maybe I should do the same! Have a great day. Great find! I have been searching high and low for a decent urn (or two!) that doesn't cost $80! I love how you used yours! Looks so good - I love the suitcases! I am not a decorator, but I can appreciate pretty things! great job! 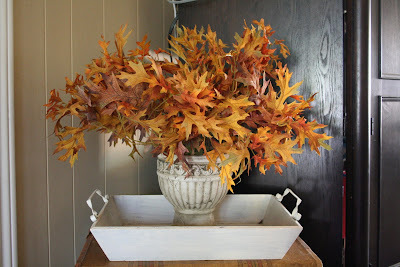 I found one last year like that at the thrift store...had to paint it...then have used it for every season. During c-mas time, I stick a little fake tree in it. 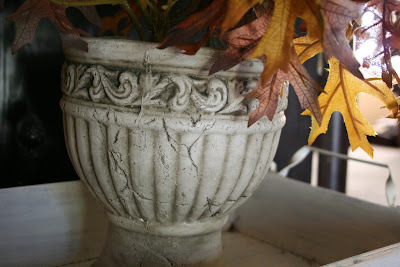 Love your fall urn! Seriously? Two dollars? Way to go! What a beautiful urn. So pretty. And I love the arrangement too! Love how you have it displayed on the suitcases! Great eye seeing what was under all those flowers! I have just featured you on my blog and given you an "Over The Top Blog" award. If you want to claim your award and participate you can go to my blog, copy, cut and paste the award, questions and name six of your favorite blogs. You are truly a girl after my own heart! You know how I LOATHE seeing cords and things plugged in. The urn is awesome...and so are your arranging skills!!! This looks just too cute! Love how you put the tray on top of the luggage. Great idea! Love the urn. Your arrangment is sooo very fallish. Thats a great urn! Much better with the fall leaves. And it looks so much better that way! Fabulous! Love the whole arrangement! 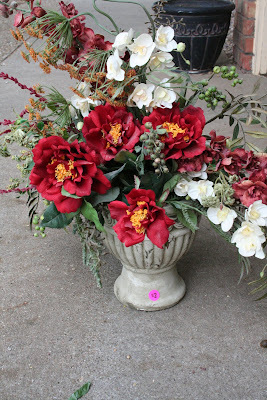 I always buy pretty urns when I see them for cheap. 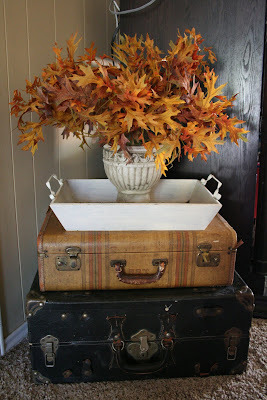 The suitcases, the tray and the urn, oh my! What a fabulous little arrangement and a clever concealing tactic! You're a genius, Melissa, what can I say? So pretty! What a vision. I need to remember this every time I drive past a yard sale! What a great fall arrangement! Love the suitcases too! You've just proven that we need to look a bit further at those "not-so-lovely" items to see the real potential. I love the arrangement with the suitcases, very chic!